Western blot analysis of NF-κB Control Cell Extracts #9243 (HeLa untreated or treated with hTNF-α #8902, 20 ng/ml, 5 min. ), using Phospho-NF-κB p65 (Ser536) (93H1) Rabbit mAb (Biotinylated). 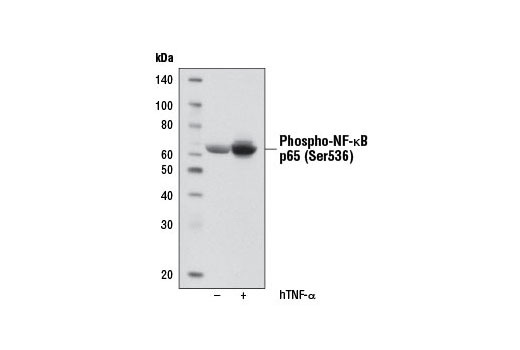 Phospho-NF-κB p65 (Ser536) (93H1) Rabbit mAb (Biotinylated) detects NF-κB p65 protein only when phosphorylated at Ser536. It does not cross-react with the p50 subunit or other related proteins. Monoclonal antibody is produced by immunizing animals with a synthetic phosphopeptide corresponding to residues surrounding Ser536 of human NF-κB p65 protein.